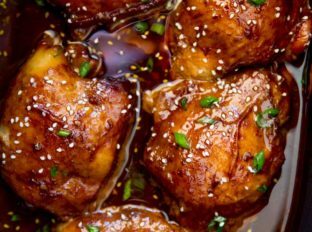 Slow Cooker Mongolian Chicken is a set it and forget it five ingredient recipe that is sweet, spicy, and full of garlic and ginger flavors! Slow Cooker Mongolian Chicken takes almost no effort at all and you’ll LOVE the dinner you end up with. The leftover sauce is so good I often add a cornstarch slurry to it and cook it on the stove top to thicken it. Then I add it to everything! On top of the chicken of course, but also over rice the next day. I actually sometimes will use leftover rice and use this thickened sauce as s mix in for a quick fried rice. 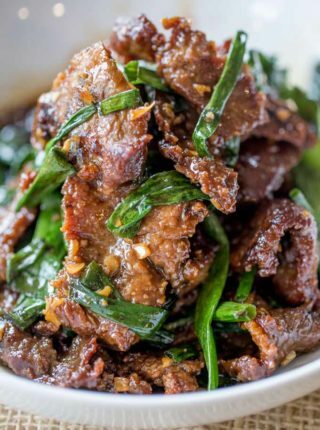 Mongolian Beef is actually one of the most popular recipes on the site, so a chicken version is long overdue! 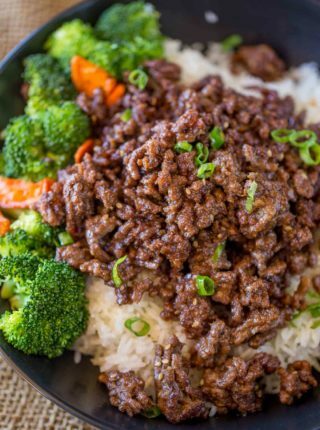 I actually also have a ground mongolian beef recipe coming up, with such an easy set of ingredients all things Mongolian beef are a huge hit in out house. I used spices instead of fresh ginger and garlic to mix things up and make this a true pantry recipe. I also found it had better texture in recipe testing as minced ginger tends to get chewy in an unpleasant way in the slow cooker. Dark brown sugar adds an extra depth of flavor because of added molasses. If you only have light brown sugar it will work too, but flavors won’t be as deep. I always use lite soy sauce to keep the sodium/salty flavor in check. Careful if using regular soy sauce. I keep the green onions out of this dish because they got a bit slimy in the slow cooker during testing. If you add them fresh in the last five minutes, I’m sure it would be delicious! 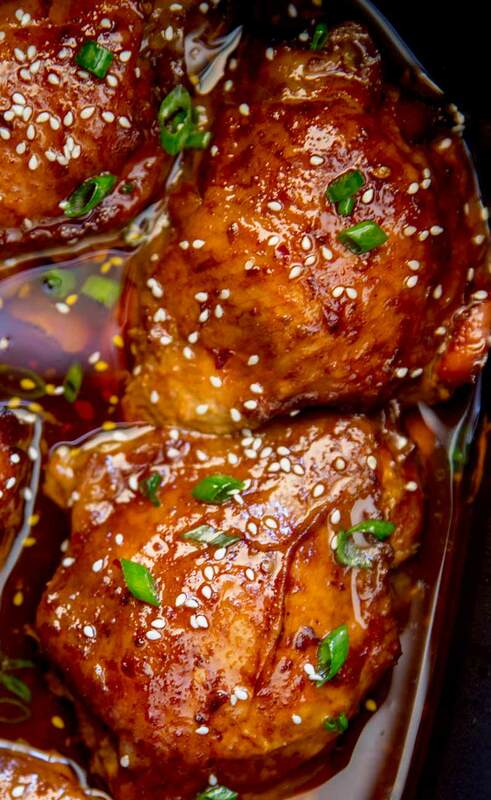 Can I make this Mongolian Chicken in the oven? Yes, absolutely. Keep the chicken in a smaller baking pan, perhaps an 8×8 or 9×13 pan (if using a few more pieces of chicken) and keep things cozy to keep the liquids around the chicken. Cook at 400 degrees for 25-30 minutes. 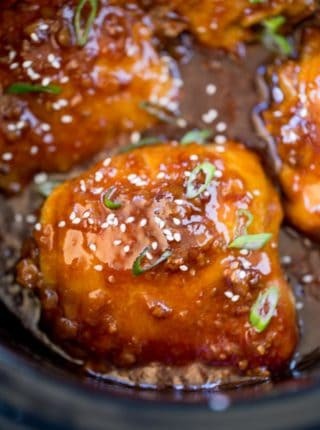 Can I make this Mongolian Chicken in a skillet? YES! You may want to use sliced/diced chicken thigh meat and add a bit of canola oil to the pan first. Then brown the chicken on medium high heat for 4-6 minutes on each side and add in the remaining ingredients until caramelized and cooked through. 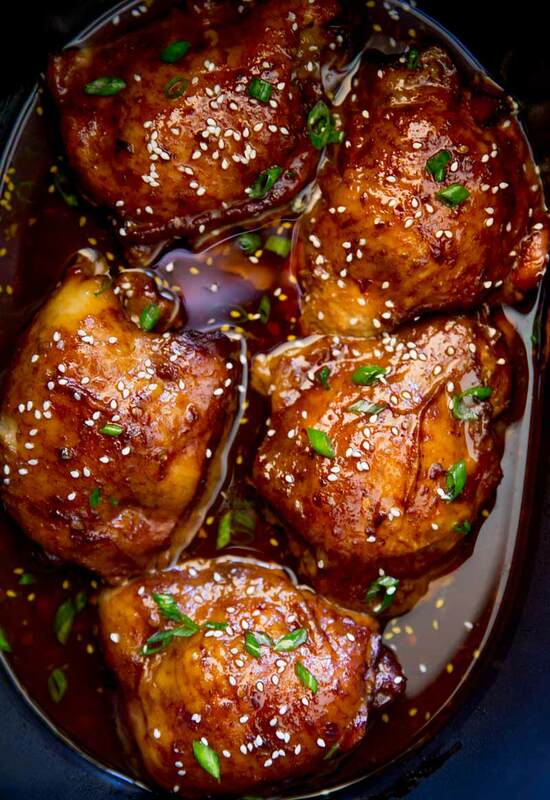 Want more Slow Cooker Chicken Recipes? My New Slow Cooker: This recipe was made in this slow cooker. For larger roasts I also brown the meat in the insert and not lose a bunch of the flavor by transferring the meat and leaving the browned bits behind. If you’re thinking of a new slow cooker, consider it if your budget is open. Soy Sauce: Nothing much to say here except Kikkoman has the best flavor overall and I always recommend reduced sodium. Mix all the ingredients and set the chicken into the slow cooker skin side up. Garnish with sesame seeds or green onions (optional). Made this today and we all loved it! Even our 3 picky boys! Thanks for sharing. We will DEFINITELY be making this more often! So glad you all enjoyed it! Pleasing kids can be tricky at times. So glad it passed the test for them. Delicious. Used minced garlic from a jar and it tasted fine. I only had full sodium soy sauce so added around 1/2 cup water to cooker. Then added more when thickening liquid. Otherwise it was too salty. The sauce was still delicious and not watery. Thanks to Eileen for her question — I would have put the sauce on top, too. Such an easy and tasty recipe. So glad you enjoyed it! Thanks for taking the time to come back and let me know. I have drumsticks! How do I adjust the cooking time? Thanks! I gave this recipe a try over the weekend and absolutely loved it! One day I baked the chicken instead of using the slow cooker because I was pressed for time and it still came out great. The next day I had thighs left over from the day before so I decided to give the slow cooker recipe a try and it was even better! This will be a repeat recipe, so simple and tasty! Thank you, Sabrina! You’re welcome, Ashlee! So glad you enjoyed it! This recipe is super simple, and delicious. After a hard day at work, it was nice to come home to the delicious smell. I used chicken legs instead of thighs. Love it, and passed it on to several friends. Thanks, Sheila! I appreciate you taking the time to come back and let me know how much you enjoyed it! This looks delicious! If I wanted to use, boneless, skinless chicken thighs, would I reduce the cooking time since the chicken is not on the bone? Thank you. How much time for boneless, skinless thighs as I don’t want to wrap in bacon as considered by another questioner? Maybe 30 min to an hour less? The problem is that the bone and skin help protect it from drying out so I would just watch it as you want to catch it in that sweet spot of being cooked but not dried out. Good luck! Just follow that but use chicken instead. Enjoy! 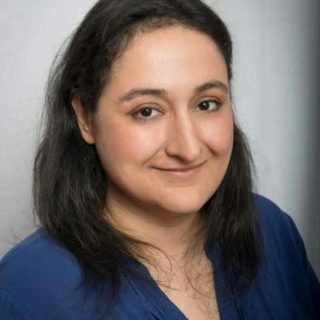 Hi Sabrina! I love this recipe, but accidentally bought skinless, boneless chicken thighs at Aldi this week. Would wrapping them in turkey bacon help keep the chicken moist? You’ll want to wrap them in regualar bacon. I don’t think turkey bacon has enough fat in them to keep the chicken moist. If you decide to try, I’d love to know how it turns out. I always double recipes as I have a giant family and some of them growing boys that can eat a lot, lol. With that said i have a giant 8 qt. crockpot. I have the space. I sample a lot of recipes for crockpot because my hubs and I Coach youth soccer so we need dinner ready waiting for our fam. Some of our favs are ones with Asian flavors. This one is a keeper! Have made it twice already! Love it! I’m so glad you all enjoy it! I definitely couldn’t live without my slow cooker recipes! If you wanted to add a vegetable to this, what would you add? I wouldn’t add a vegetable to the slow cooker. You don’t want to crowd it while it’s cooking. If I double the recipe, how long should I cook it? You really don’t want to crowd the slow cooker so I’d suggest using two different slow cookers or making this in the oven. Do you put the sauce in before or after the chicken? Sounds silly to ask, just want to get it right the first time around! I have a broken foot and am hobbling around. This sounds so simple and delicious. Thanks for posting! Not a silly question at all! Mix the sauce ingredients in the slow cooker and then put the chicken on top of it. Made this on Sunday for Monday night dinner. Tastes great!!! Thickened the sauce on the stove and will serve with rice and broccoli. I’m so glad you enjoyed it! Thank you for the 5 star rating! I’ve never tested it so I don’t feel comfortable suggesting it but I’m sure you’ll be able to find another recipe online with similar ingredients to follow. Let me know how it works out if you decide to try it. Made this! I added in some red pepper flakes and 1/2 cup of water. It was amazing and soo so tender. My girlfriend hasn’t stopped raving about it. Will make again! Can you use boneless skinless chicken breast?? I usually don’t recommend using skinless chicken breast in the slow cooker as it can tend to dry out. As long as you know that going in, you could definitely give it a try. This looks like absolute dinner perfection! 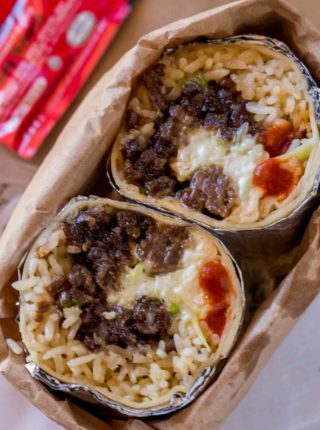 That sauce has me drooling! I’m about to get the slow cooker out for the season and this looks delicious! I may want to try this! Looks and sounds so good! Getting my slow cooker out for this! Gotta love that classic Mongolian sauce! Can’t wait to try this! Love how easy this is! Looks so tender and flavorful! So many delicious flavors! 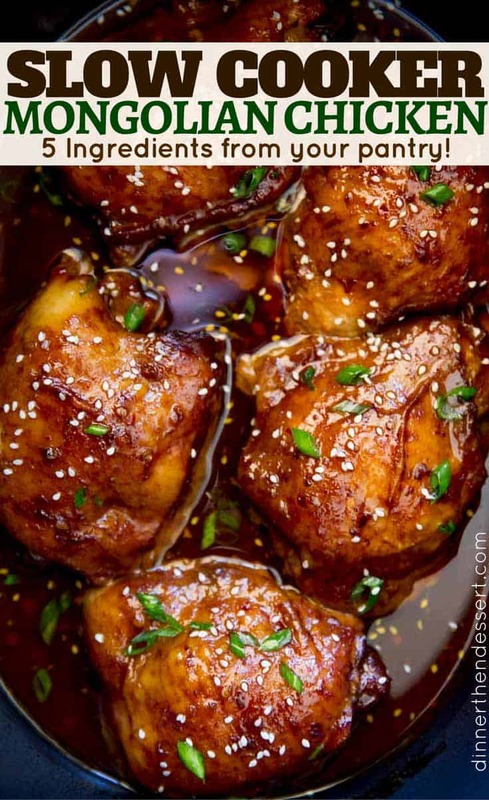 Love that you used chicken thighs for this. This chicken looks like the perfect easy dinner idea! Thanks!